Today I want to share my spin on an office look. This will be a corporate style inspiration, but in upcoming posts I'll share also outfits for working in a more creative environment. In order to make this outfit more me and fun, I opted for an asymmetric draping blazer, an oversized structured blouse and a statement ring. I think the draping blazer and statement necklace give the look some personality and a modern touch. For a pop of colour and boldness, I added a watermelon lip colour. Also, I look like my mother in the first pictures, which is a bit weird but I like it. Heels are great, it gives this look a lot of class. I love the bright lip! Such a great blazer, too! In love with your office look! 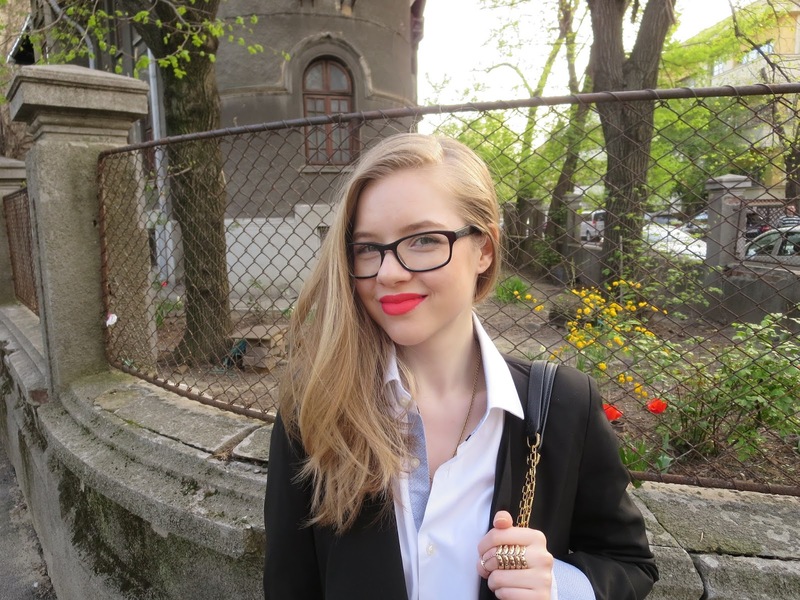 Wow I love this outfit especially the jacket and the lipstick :) Your blog is so cute too! The perfect office look indeed! Love the bag! Amazing outfit, great combo as well, I love it, you look very pretty, thank you for sharing!!! I like your style, great corporate look. Nice ring and bag. Really chic ! I love the shoes ! Great look! I was actually looking for a sophisticated look. I have an interview soon...wish me luck! nice outfit! so simple yet so stunning! im dead :O the bag is so cool. Super chic look dear! Love it! Hello guapa..te just read on my blog I'll follow by GFC I hope again to follow me too. So effortlessly chic! I love the photo of you in front of the flower tree- just gorgeous! Such a chic and sophisticated work attire! You look gorgeous! Such a chic and elegant look! You look amazing, my dear. Love the color of the shirt! Love that lip colour! It looks perfect on you! Ps. do you want to follow each other's blogs on bloglovin'? Nice outfit! Stylish office look!